The Pantanal and K-Nine on the move. 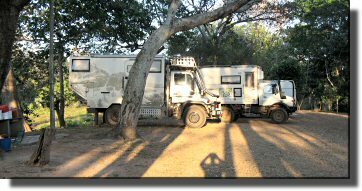 This page comes to you from the fine campsite of the Passo do Lontra, Parque Hotel in the southern Pantanal, Brazil. 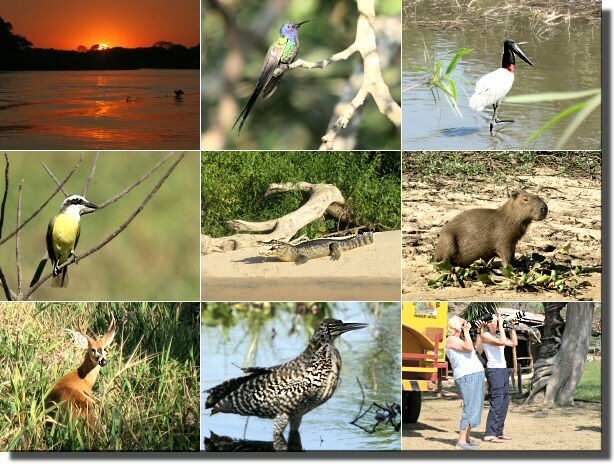 (As you must know the Pantanal is an area of wetland half the size of France and rightly famous for its wildlife.) The campsite has water, electricity (both 220 and 110 volts), showers and an excellent view! From inside Mog I have seen a jabiru stork (over a metre tall! ), families of capybaras, lots of cayman and I can currently see (and hear) a troupe of howler monkeys directly overhead. Camping costs $7 USA per person per night and the nearby restaurant charges about $10 USA for a (mediocre) evening meal. (S19.577702 W57.021395). There is a raised boardwalk connecting the camping area with the hotel proper and the restaurant. Recommended. To get here you take the BR262 west from Campo Grande and about 103km beyond Miranda (near Km 664) you turn right on the unmade road MS184 and follow the signs to the Parque Hotel. On this road you must cross a number of fairly rickety looking wooden bridges rated at 15 Tonnes. The main assets of the Parque Hotel are a 1.5km raised boardwalk from which you can see the wildlife and access to the river on which you can take boat trips. However if you just sit in the campsite lots of the wildlife comes to you. 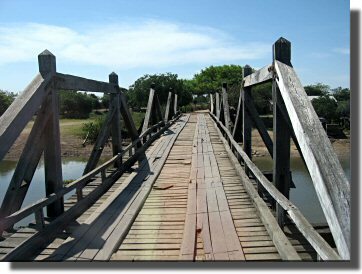 When you get tired of the wildlife at the hotel you can drive 24km farther into the Pantanal (over more rickety bridges) to Sao Joao Farm (also run by the Parque Hotel) where you can camp. (S19.400775 W57.040315) Note that the latitude and longitude given on the Parque Hotel literature is wrong). From the Sao Joao Farm you can take horse (back) rides as well as wildlife walks. Stop Press: Good news, we have just heard that K-Nine have left Asuncion and have crossed into Brazil at Ponta Pora. They are now heading for Campo Grande where we hope to join them on Friday 2006-08-25. We understand that K-Nine's turbo is not yet fixed. More details when we have them.